The Maharajas is the new restaurant and bar on Great King Street. 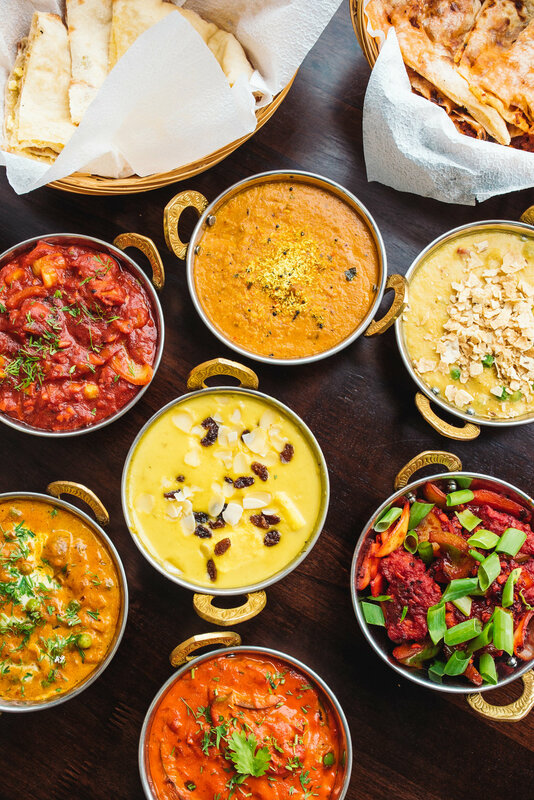 The Maharajas showcases the vibrant and colourful food culture of India to provide a unique and delicious dining experience for all our customers. 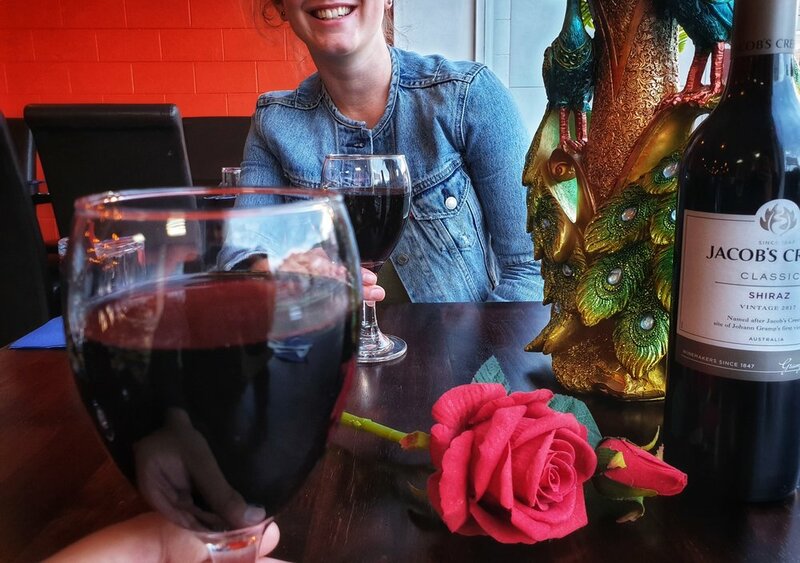 Our cuisine predominantly hails from the beautiful north of India, but some of your favourite southern dishes are included on our menu as well. The Maharajas prides it self on delivering friendly customer service and we are able to cater for large groups. A takeaway menu is also available for those seeking a to take a burst of diverse Indian flavours home to enjoy. On Sunday nights all curries except seafood are $12 ! No B.Y.O charge on Thursdays!. if you are currently a student and show us your student ID you can get 10%off your total order. If it's your birthday and you bring in 4 or more mates to dine-in with you and get them all to buy a main. You’ll get your main for FREE. Crisp pastry filled with diced seasoned potatoes, peas & cumin seeds. Fried golden brown. Crispy onion fritters served with tamarind sauce. Sliced potatoes, cauliflower, onions, spinach, mixed together in chickpea batter containing mouth-watering Indian herbs and spices, then deep fried. Chicken fillets marinated in yoghurt & spices overnight, cooked in Tandoor. Lamb mince, flavoured with traditional Indian spices, skewered & cooked in Tandoor. Traditional Indian Tandoori barbecued chicken. Mini chicken drumsticks battered in mouthwatering herbs & spices, lightly fried. Served with golden brown fries and sweet chili sauce. X2 Veg Samosa, Onion Bhaji, Chicken Tikka, Seekh Kebab. Fresh mushrooms marinated in garlic, yoghurt & spices. Cooked in the Tandoor. Cottage cheese marinated with herbs & spices, cooked in Tandoor. Fresh Giant King Prawns lightly fried in traditional Indian herbs & spices served with chips & tartare sauce. Two pieces of Samosas, Onion Bhaji, Paneer Tikka, Gobi Pakoras (Cauliflower) & Tandoori Mushrooms. Prawns coated with Indian herbs & spices cooked in Tandoor. Lightly spiced chicken pieces sprinkled with garlic. Cooked in Tandoor. Marinated lamb cutlets cooked in Tandoor. Two pieces of Tandoori Chicken, Chicken Tikka, Chicken Malai Tikka, Lamb Cutlet & Seek Kebab served with mint. Diced potatoes & cauliflower cooked with traditional Indian spices. Diced potatoes cooked with cumin seeds and other flavoursome spices. Diced mushrooms & vibrant green peas cooked in garlic, herbs & vegetable gravy. Crisp seasonal vegetables mixed with aromatic spices & garnished with cashews & crushed poppadum. Mashed potato coated in cottage cheese, deep fried & cooked in a rich gravy. Bite-size Cottage cheese pieces & green peas cooked with spices, diced tomatoes & herbs. pieces of cottage cheese cooked in a creamy tomato flavored sauce. Diced mushrooms cooked with onions, garlic, ginger, coriander, yoghurt & cream. Steamed chickpeas cooked in onion & tomato based gravy. Cottage cheese cooked in mild spinach puree & spices. Diced Potatoes cooked in mild spinach puree & light spices. Stewed lentils soaked overnight & cooked on a low flame, garnished with fresh coriander. Flavorsome yellow lentil cooked with cumin seeds & garlic. Tandoor roasted eggplant cooked with garlic, ginger, aromatic herbs & spices. Marinated boneless chicken pieces. cooked with garlic, ginger, Indian mixed pickle & spices. Can be served Freaking hot! Tender chicken pieces cooked with vegetable gravy with capsicum, onion, ginger, garlic, herbs & spices. Tandoor roasted boneless chicken cooked in a buttery gravy. Black pepper chicken cooked with garlic, herbs & traditional Indian spices. Diced Boneless chicken cooked with cashew nut gravy & homemade cream. Diced Boneless chicken cooked in mild spinach puree with a special mix of spices. Medium hot Southern Indian chicken curry garnished & prepared with coconut. An exotic chicken curry with a creamy mango gravy. A flavoursome chicken curry containing crushed tomatoes, capsicum & green chilies, cooked in thick masala gravy. Tender chicken pieces marinated in corn flour, eggs, soy sauce, chef`s secret herbs & spices, deep fried, finished with diced capsicum, onions & tomatoes. Diced boneless chicken marinated with our special herbs & spices, cooked in our top secret sauce. Spicy chicken curry straight from the exotic beaches of Goa (must be served spicy hot). Meat of choice cooked in spinach puree with tomatoes and spices. Meat of choice sautéed with onions, tomatoes, cooked in cream and garnished with coconut. Diced meat of choice sautéed with onions, garlic, ginger, coriander, yoghurt & cream. Meat of choice cooked in Northern Indian Style sauce with garlic & ginger. Meat of choice with cashew nut gravy & homemade cream, traditionally cooked. Delicious Southern Indian medium hot, meat of your choice, curry garnished & prepared with coconut. Meat of your choice cooked in chef`s specially made gravy with capsicum, onion, ginger, garlic, aromatic herbs & spices. Diced lamb cooked with ginger, garlic, onions & spices in a traditional Northern Indian Style. Diced lamb cooked with aromatic green herbs, spices & chef`s special fresh fenugreek sauce. Min 2 persons - includes the Mixed Platter & four curries as the Main course; Butter Chicken, Lamb Nawabi, Beef Jalfarezi, Channa Masala, Naan, Tamarind Sauce & Mint Sauce. The Ultimate Treat! Hoki fillets cooked in a thick tomato & coconut gravy finished with lemon & cream. Succulent prawns cooked with onions, capsicum, tomatoes & fresh coconut milk, garnished with cream. Succulent prawns cooked with ginger, garlic, capsicum in special gravy. Hoki fillets cooked in masala sauce. Tender half tandoori cooked prawns fully cooked in creamy tomato sauce. Delicious mouthwatering prawns cooked with spinach puree with herbs & spices. Rice cooked with vegetables, herbs & spices. Rice cooked with chicken, herbs & spices. Rice cooked with lamb, herbs & spices. Plain flour bread garnished with butter. Plain flour bread garnished with garlic. Unleavened wholemeal flour bread with lashings of ghee baked in Tandoor. Naan stuffed with spiced mince mixture. Naan stuffed with a cheese. Special Naan from Peshawar, plain flour bread stuffed with sultana, and coconut. Plain flour stuffed with spiced potatoes and peas. Kulcha with a stuffing of diced onions and spices. Naan stuffed with a cheese and garnished with garlic. Naan stuffed with cheese & keema, garnished with butter. Diced onions, cucumber & tomatoes with a special mix of spices. Sweet mango chutney, pickles, raita, tomato & kachumber. Yoghurt mixed with cucumber & ground spices. A fresh salad with onions, tomatoes, cucumber with Indian masala. Mango flavoured Indian ice cream. Naan stuffed with delicious chocolate, served with whipped cream. 2 pieces of popular milk-solid-based Indian sweets. Sweet Carrot pudding, garnished with cashew nuts. Vanilla ice cream drizzled with delicious mango sauce. Please tell us what we can improve to make The Maharajas better. Can be anything from our website to our social footprint to our dine in experience.